Abdominal muscle exercises. Full abdominal workout plan and Ab workout routines. Build an effective upper and lower abdominal workout. Step 1. Using a decline bench, lay down all the way back. For added support, place your hands behind the head. Step 2. Begin lifting your body, tightening the abdominals. Hold that position for a second or two, then begin lowering your body back in to the starting position. Step 1. Lay down on a flat bench, extend your legs, keeping them up off from the ground. Stabilize yourself by holding on to the bench from underneath your body, or keep your hands tucked under. Step 2. Begin raising the leg, bending the knee in toward the upper abdominal area. Step 3. Slowly lower the leg and straighten it back to starting position. Step 1. 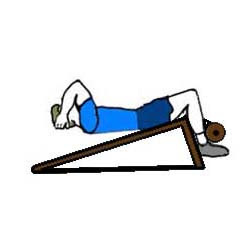 Lay down on at flat bench with your legs up and your knees bent. Hold your body in place by holding the bench, reaching behind the head. Step 2. Begin to raise the lower end of your body, while keeping your legs in the same position throughout. For best results, brings the knee up as far as you can. Step 3. Make sure you really focus on the abdominals to insure that the abs are responsible for the movement going up and back down again. Step 1. Lay on a floor, with your knees up, and your hands positioned behind your head for added support. Step 2. Simply lift your body upward until you feel you've fully contracted the abs. do as many repetitions as you can before resting. Take very short breaks when doing abdominal muscle exercises. From: Abdominal Muscle Exercises. Back To: Weight Lifting Exercises.